Rodger Pyrah talks to Staffroom about his proven method to deal with difficult people and the 3 steps to tackle bullying in the workplace. Difficult behaviour is commonly defined as “repeated, health-harming mistreatment of one person by another”. 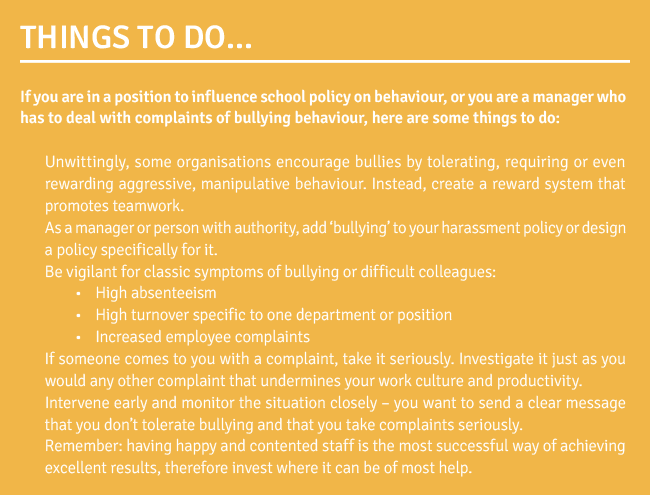 Actual behaviours take on many forms, but for teachers, one of the most prevalent examples is workplace bullying between members of staff. A survey carried out by the Association of Teachers and Lecturers (Easter 2012), says that about a quarter of teachers have been bullied by another member of staff. The bullies are often other teachers who pick on their staffroom colleagues – with heads and senior staff alleged to be among the worst culprits. The survey of more than 900 primary, secondary and further-education staff across the UK, published at the union’s annual conference in Liverpool, showed that many teachers faced a range of workplace bullying threats. But among the teachers who felt they had been bullied, 50% said it had been by a senior member of staff, compared to 25% by pupils, 23% by parents, and 2% by others. The survey looked at the type of bullying that these teachers had faced from pupils, parents and fellow teachers. The most widespread forms of bullying were “negative comments” and verbal insults. But almost half of bullying victims claimed they had been intimidated – for example, being threatened or sworn at – and two out of five reported “psychological abuse”. Social networking websites are being used to threaten and make false allegations against teachers. Another survey, carried out by researchers at the University of Plymouth, found that almost four out of ten teachers have experienced such online abuse. Chris Keates, general secretary of the NASUWT, described the level of online abuse against teachers as “truly shocking”. The teachers’ union, says that teachers have even faced death threats from pupils writing on websites. There have been false allegations of “inappropriate behaviour with a pupil” and attacks on teachers’ professional ability, according to the survey. According to the research, 16% of teachers had faced online insults from parents. Who are these difficult people? What is probably driving these statistics is the psychology behind bullying and difficult behaviour. While difficult people may come across as very confident, assertive and capable, they are more likely to be insecure and feel threatened by the person they target. They are ambitious and highly motivated; however, they can lack the dedication or skills required to achieve the level of success they think they deserve. Hence, they step on others and try to manipulate them to accomplish their goals. The target, on the other hand, is typically very competent but with one critical character trait – he or she is likely to be particularly helpful and caring, and therefore motivated to heal relationships and make the world a better place (which is one reason why bullying is particularly common among healthcare workers and educators). This makes them ripe for exploitation, because they don’t match aggression with aggression. They believe they can overcome the bullying with goodwill and persistence. They try to work with the bully, and go along with what they think the bully wants as a way of pacifying him or her. Only 11% will actually report the bullying, and the average target endures the bullying for 22 months. What can you do to stop and prevent difficult behaviour? Herrick International, providing facilitation courses across the public, private and voluntary sectors, provides a simple and effective three-step process that you can apply. If you are aware of bullying or difficult people in the workplace or you find yourself targeted by them, use these three steps to put an end to it and alleviate the suffering. You know what difficult behaviour is and you are now better able to recognise it for what it is. As long as this behaviour is shrouded in secrecy and considered one of those dirty little secrets at work, it will continue. So, the vital first step is to recognise that bullying is actually happening in your working environment. This has the important psychological value of identifying that the bully – rather than you – is the source of the problem. Every year primary teachers meet a new class of excited and energetic children. The first thing they establish are ‘rules of behaviour’ in their classroom. This identifies what is expected of each child – usually created by the children themselves and, from this simple beginning, children will be engaged in their own control of classroom behaviour. Of course, some children will step over the line and each teacher will provide a set of consequences for each challenge to behaviour, such as the ‘naughty step’. However, which ‘rules of behaviour’ do you have in the workplace? Most schools do not mention staff behaviour, never mind spelling out specific detail, and the rules can therefore be open to interpretation. What information is provided to parents about expected behaviour? Are staff empowered to challenge unacceptable behaviour? And are there consequences that are always followed up in cases of unacceptable behaviour? The bully has to be exposed and their tactics revealed. It’s never an easy thing to do; however, if you have laid out precise expectations regarding behaviour norms and you have the data, support and evidence you need to make your case, you must take your complaint to the highest level you can – and present the factual evidence. Rodger brings over 20 years' experience as an educator and a headteacher to his training courses. His warm and intelligent style will inspire you to achieve outstanding project results. Want to learn more? Join Dave Scott on his one-day course and learn how to handle bullies, moaners, procrastinators and killjoys, defuse aggression with parents, teachers or colleagues and expertly manage behaviour that leads to difficult situations.